President Trump And Resilient Expert Steve Conboy Have To Meet Before California Rebuilds. Until our President calls for a California Wild Fire Summit with third party Wild Fire Resilient Experts, we are going to continue to rack up historical wild fire losses. Our government needs opinions from more than just California Politicians, Cal Fire and the IAFF. Sometimes for those too close to the problem, solutions do not show up fast enough. 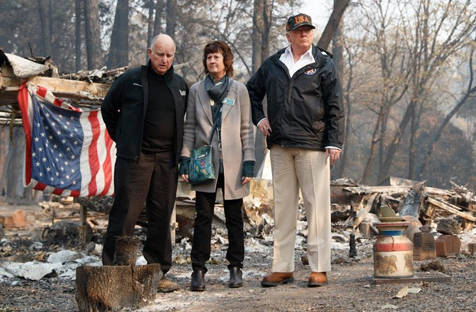 PARADISE, Calif. — President Trump walked through the ashes of the Northern California town of Paradise on Saturday, promising to help the state recover but repeating his disputed view that forest management was to blame for the fire, the most destructive in California’s history. The president, expressing shock at the scale of the devastation and praising the efforts of emergency workers, offered much more conciliatory words than he had used a week earlier when he accused state officials of mismanaging California’s forests and threatened to withhold financial assistance. “Nobody would have ever thought this could happen,” Mr. Trump said on Saturday, standing in the remains of a mobile home park in Paradise, the town in the Sierra Nevada foothills where most homes were incinerated by the so-called Camp Fire. “I don’t think we’ll have this again to this extent,” he said. “Hopefully this is going to be the last of these because this was a really, really bad one.” President Trump we have lots more Paradises all around California and they are just as vulnerable to what was just consumed in Thousand Oaks and Malibu. Too many California towns are full of dry vegetation fueling, like in Alpine, Santa Cruz or Vista and that have a higher risk of loss than the dead forests do. There is way more to the states mismanagement of wild fire risk, when leaders are more focused on clean energy than saving California families homes. All the clean energy in the world can not provide any value until we stop producing so much greenhouse gas from all our wild fires. In this wild fire rebuild crisis, we must put politics aside and join together to help all those hurt American families and find new ways to be proactive from new losses that are imminent. In order to plug the future government sink hole wild fire funding, we have to rebuild with fire resilient applied science. We need to have the administration to provide funding or tax credits to retro fit all those other communities that are still wild fire vulnerable. Without adding retro fitting what is vulnerable, alongside these rebuilds, this sink hole of wild fire funding support will continue to grow. The California dry vegetation mismanagement has fuel piled 4 to 6 feet high which is a much greater threat than our dead forest when it comes to housing losses. The western region housing tracts also has wildfire design flaws and until they are dealt with, we will continue to accumulate higher loses, year after year.